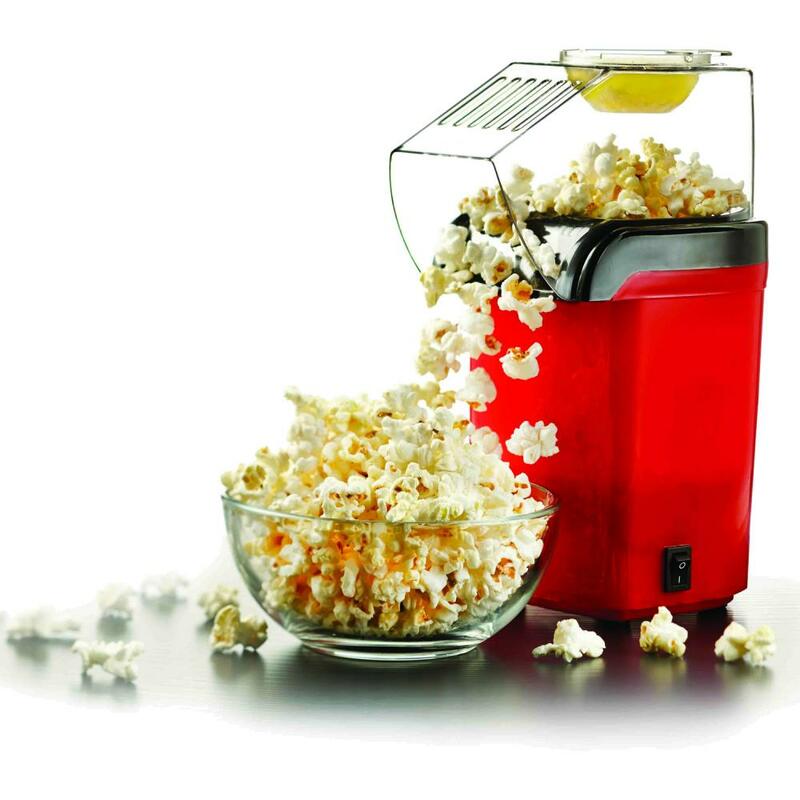 Be the hit of your home, church or office with the AmeriHome Popcorn Popper. The compact tabletop design makes theater-style popcorn in 3 minutes for your family and friends. Make family movie nights more authentic, and meetings more fun at work. Nothing gets folks more excited than the smell of fresh popped popcorn. Always make enough to share. 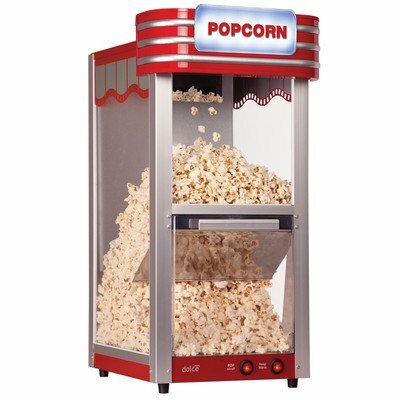 Making popcorn is fun and healthy with the Brentwood corn popper. 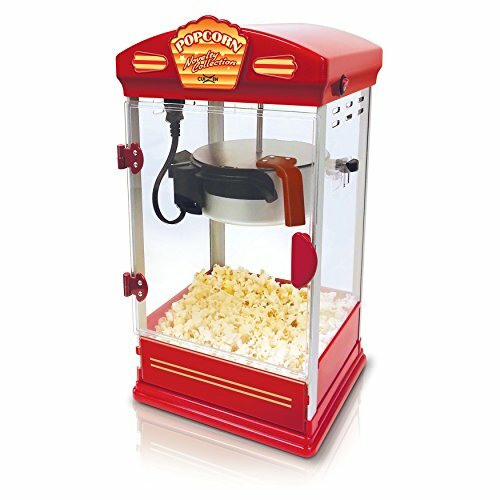 Hot air pops fresh popcorn from the chute to your bowl in minutes. Popping with air instead of oil means less fat and fewer calories for a healthy snack. The unit makes up to 12 cups of popcorn and has a handy measuring cup that doubles as a butter warmer. measuring cup that doubles as a butter warmer. 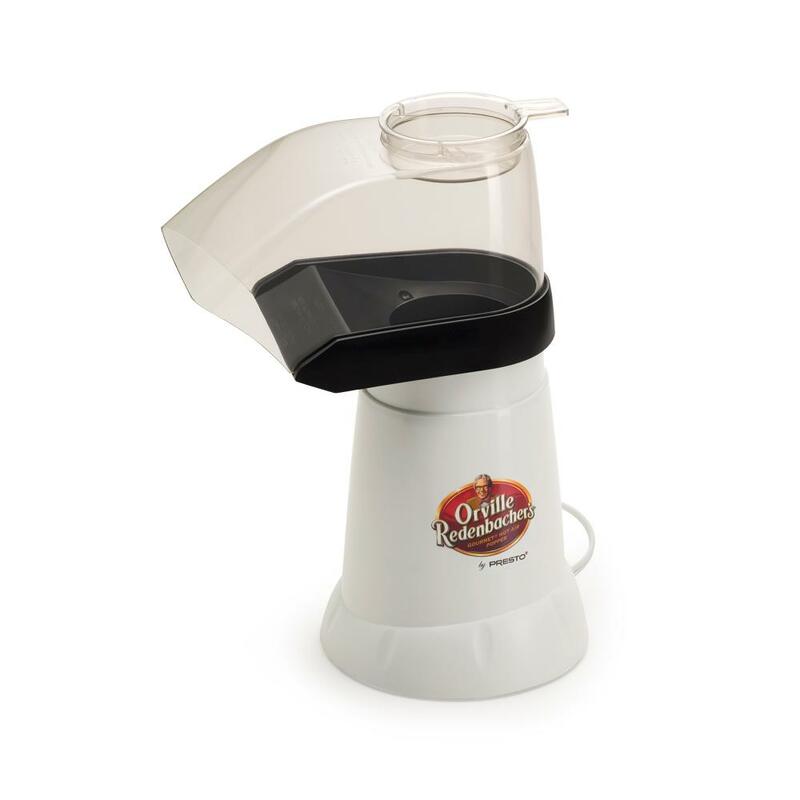 CUIZEN TABLETOP POPCORN MAKER� HWCZ4040 CuiZen's 4 Ounce Tabletop Popcorn Popper gives you an easy and entertaining way to make the perfect batch of popcorn every time. The large capacity 4 ounce aluminum kettle has a non-stick coating for easy clean ups and an unique external kettle release button. The external release button means no spilled popcorn or hands near the hot kettle. The convenient drop down bottom door gives quick and easy access to popcorn. The clear Plexiglas sides give you a window into the process. 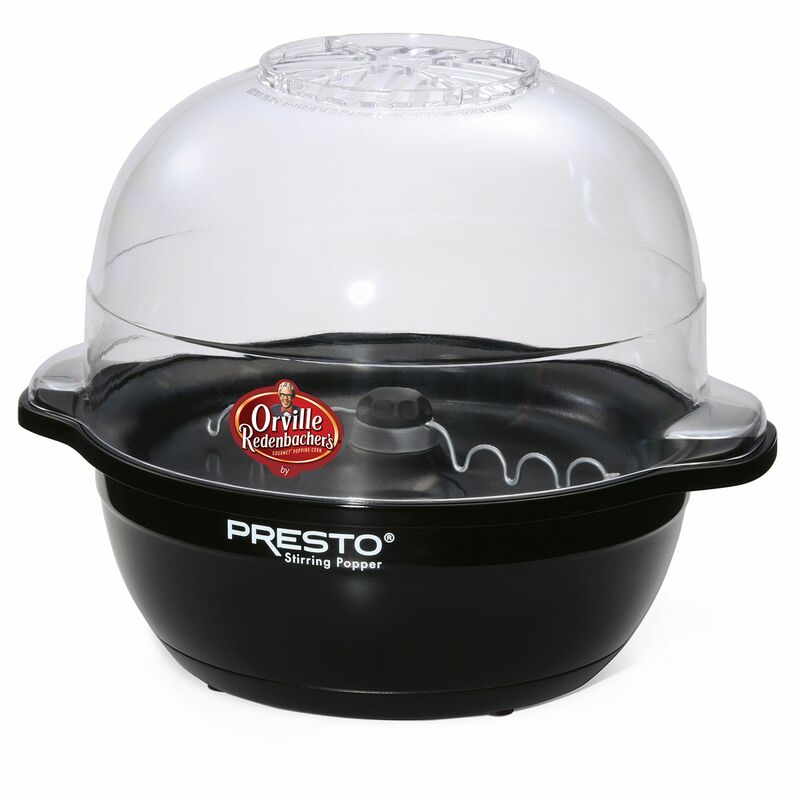 � Enjoy up to 6-quarts of freshly popped popcorn External kettle release button means no spilled popcorn or hands near the hot kettle 4-ounce non-stick coated kettle Includes oil measuring spoon and measuring cup Convenient drop down door for easy access . 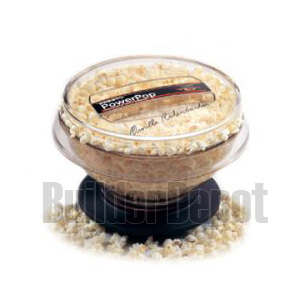 Orville Redenbacher's Fountain Hot Air Popper pops like a fountain! Popcorn flows into the cover as it pops. Pops with hot air not oil for a low--fat treat. Pops up to 20 cups with virtually no unpopped kernels. Specially engineered stainless steel restrictors' helps optimize popping performance. 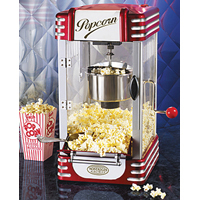 Pops up to 20 cups of popcorn in about 3-1/2 minutes. Vented cover assures crispy popcorn. Makes as much or as little as you want from 10 - 20 cups. Base nests inside cover for compact storage. Cover doubles as a serving bowl. Just snap lid on vented cover flip over and remove base. Pops without oil so the base and cover simply wipe clean. This item cannot be shipped to APO/FPO addresses. Please accept our apologies. 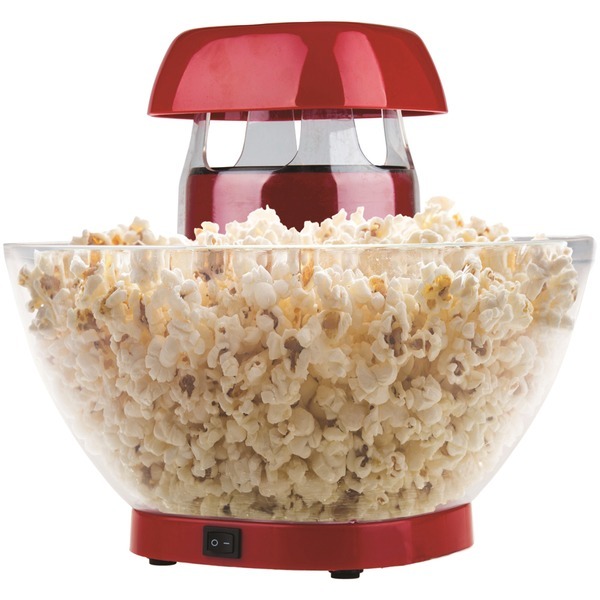 Red PopLite Hot Air Popper is a faster healthier and more economical than most microwave bag popcorn. Use regular or gourmet popcorn with terrific results virtually no unpopped kernels. 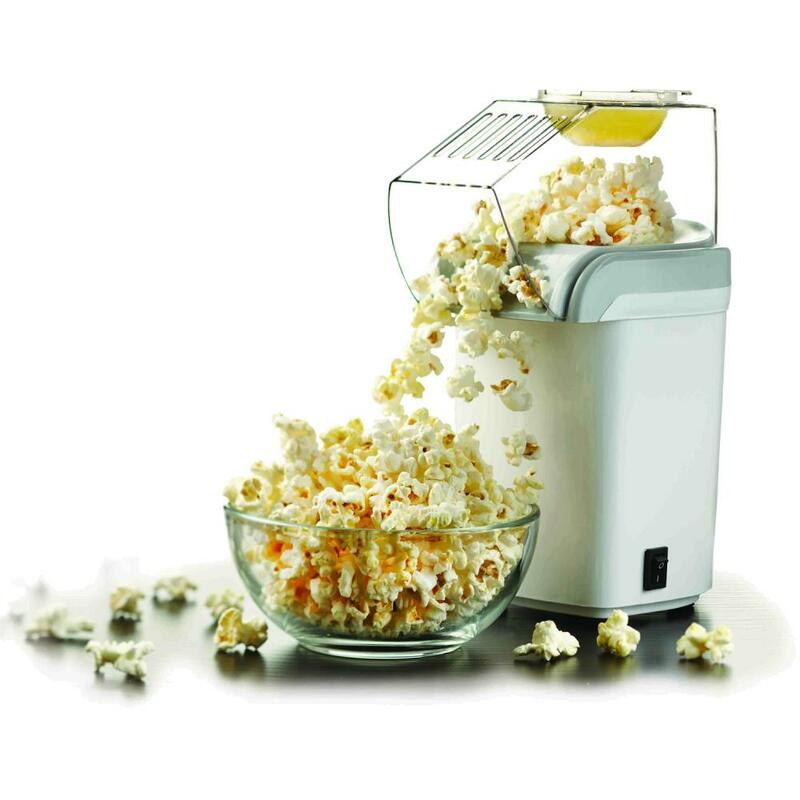 Pops up to 18 cups of gourmet popcorn in less than 2-1/2 minutes. Butter melter doubles as a handy measuring cup. Chute directs popcorn right into your bowl. Base and cover simply wipe clean. This item cannot be shipped to APO/FPO addresses. Please accept our apologies. Bring the fun of the carnival home. 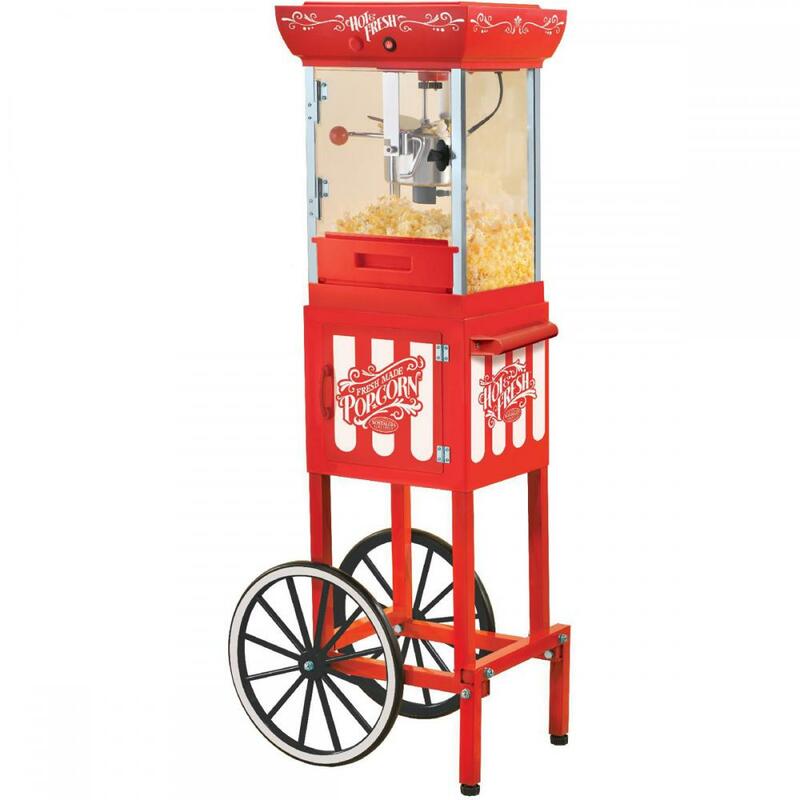 This popcorn cart is 48 inch tall with a 2.5 ounce kettle for hot oil cooking, and features a compartment for storing supplies. Makes 10 cups of popcorn per batch. Tempered glass windows, warming light, and kernel catcher. 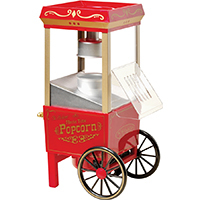 This Old Fashioned Kettle Popcorn MakerGS= is a convenient, tabletop-sized party pleaser. It makes delicious, kettle-cooked popcorn for everyone to enjoy in just minutes! 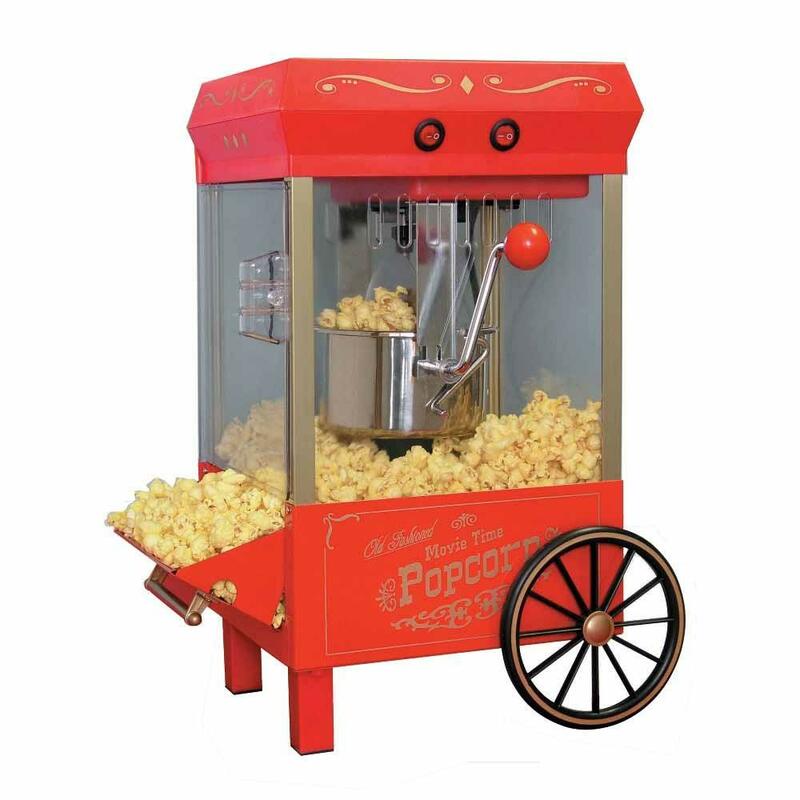 A small replica of the vintage vendor carts of the early 1900's, this unit includes a measuring cup and pops up to 10 cups of popcorn per batch. Keep foodservice fun and fresh with classic-looking, striped popcorn bags. Blue-and-red striping with a fun illustration makes bags an ideal choice for use at fairs and outdoor events. Convenient pinch-bottom bags make an easy quick-service option. Popcorn bags make an economical alternative to cartons and tubs. Food Container Type: Carryout; Material(s): Paper; Color(s): Blue/Red/White; Depth: 1 1/2". PRESTO 04830/POWER POP/MULTI POPPER The microwave popper that really works! It pops up to three quarts of delicious popcorn in as little as 2 1/2 minutes. Pop with oil for a buttery flavor or without oil for a lighter snack. The exclusive PowerBase™ and PowerCup� concentrators combine to focus microwave energy so effectively that virtually every kernel pops. Fits in most microwave ovens, even compact models with cavity sizes over 6 1/2 inches tall by 10 inches wide. Easy to clean! The bowl and lid are fully immersible and dishwasher safe. 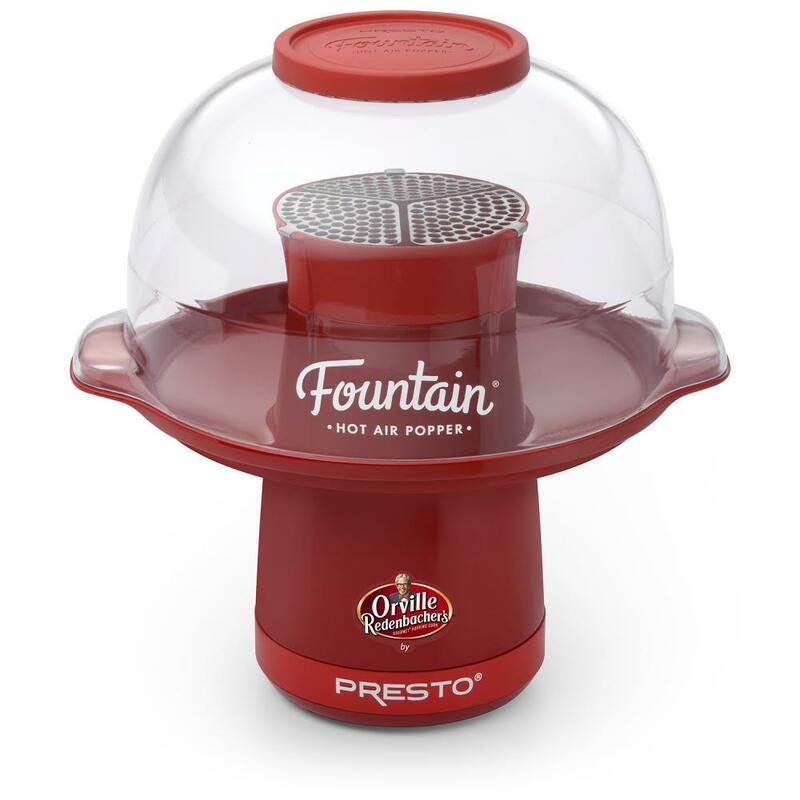 Created by Presto and Orville Redenbache-+, this hot air corn popper pops up to 18 cups of gourmet popcorn in less than 2 1/2 minutes with virtually no unpopped kernels. It has a butter melter that doubles as a handy measuring cup. The chute directs popcorn right into your bowl and the base and cover simply wipe clean. This 6-quart capacity popper makes enough popcorn for the entire family. The motorized, scalloped stirring arm distributes kernels evenly resulting in virtually no unpopped kernels. A built-in melter distributes butter over corn. Attach the butter melter lid and flip popper over to use the cover as a handy serving bowl. Base nests inside cover for compact storage. Big 6-quart capacity popper makes great-tasting popcorn. Makes enough for the entire family. The motorized, scalloped stirring arm distributes kernels evenly. Leaves virtually no unpopped kernels.Transparent cover. Multi-point cover venting assures crispy popcorn. Built-in melter distributes butter over corn as it pops. Attach the butter melter lid and flip popper over to use the cover as a handy serving bowl. Nonstick popping surface cleans easily. Poplite, Hot Air Corn Popper, pops with hot air, not oil, for a healthy, low calorie snack. Faster, healthier and more economical than microwave bag popcorn. 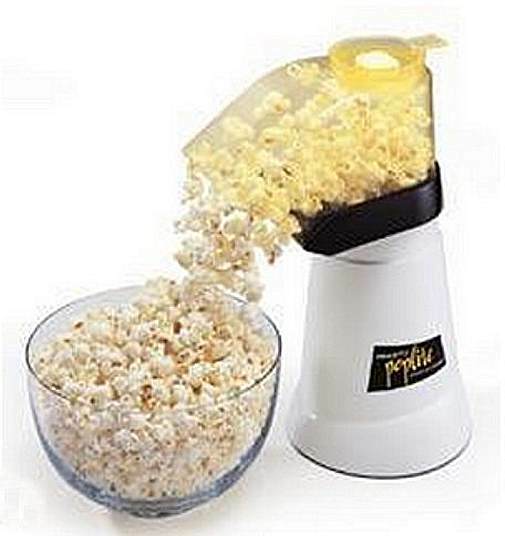 Pops up to 18 cups in less than 2-1/2 minutes with virtually no un-popped kernels. Butter melter doubles as handy measuring cup. Chute directs popcorn right into your bowl. Stop paying extra for pre-sliced food. Slice your own meat, cheese, bread, vegetables, and fruit quickly and easily with the high-quality Black Professional Style Food Slicer from Kalorik. This stylish, aluminum-housed slicer features a specialized curve design that allows for easy slice removal as well as space to catch and organize your cuts. Our professional-style, precise thickness control knob makes selecting your cut thickness simple and easy, up to 9/16" (15mm). 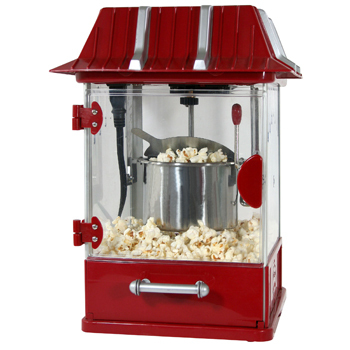 The Kalorik Red Healthy Hot Air Popcorn Maker is an easy-to-use, healthy alternative to a traditional popcorn maker. It uses hot air to pop kernels without the addition of oil, resulting in a crisp and tasty snack. Use the multi-purpose scoop to pour kernels into the popping chamber, then secure the transparent lid and flip the switch-you'll have 8 to 10 cups of fresh popcorn in just 3 minutes! You can also use the multi-purpose scoop, which rests on the lid, to melt butter as your kernels pop. The Kalorik White Healthy Hot Air Popcorn Maker is an easy-to-use, healthy alternative to a traditional popcorn maker. It uses hot air to pop kernels without the addition of oil, resulting in a crisp and tasty snack. 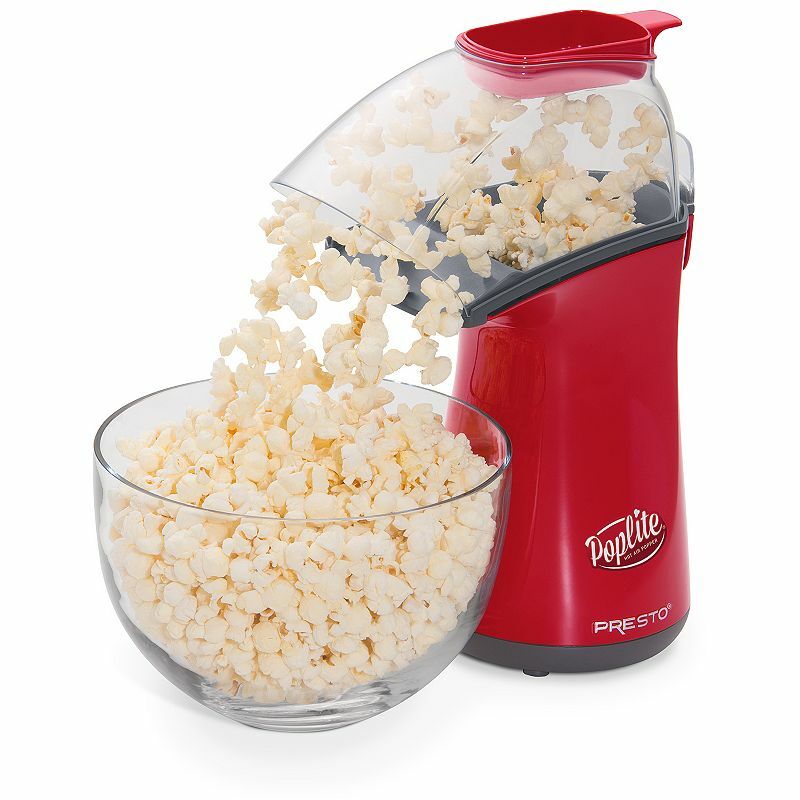 Use the multi-purpose scoop to pour kernels into the popping chamber, then secure the transparent lid and flip the switch-you'll have 8 to 10 cups of fresh popcorn in just 3 minutes! You can also use the multi-purpose scoop, which rests on the lid, to melt butter as your kernels pop.